I just graduated from college (and obviously with the way the economy is, i'm going to need all the help that I can get). I already have the ingredients for a Steady Work or Job Getting Honey Jar. Now my question is: how do I write out the petition on the paper? Just 3 times my name and the petition circling around it? or is there a different method for doing a job spell? I do not know if I would do a honey jar in this way. A honey jar is usually aimed at a specific person, e.g. a Court Case honey jar targets judge, jury, and/or lawyer); a Boss Fix honey jar targets a boss, a Reconciliation honey jar targets and ex-friend or ex-lover; and a Peaceful Home honey jar kit targets a family member. If you are using your Steady Work Honey Jar Kit for job-getting, you will need more than your name and a peition -- you will need at least the names of the companies at which you are applying -- but better, the names of specific people in the hiring departments at those companies whom you wish to sweeten. Alternatively, if you have no companies or people in mind,you could try a Steady Work spell kit. msg33 wrote: I just graduated from college (and obviously with the way the economy is, i'm going to need all the help that I can get). I already have the ingredients for getting a job. Now my question is: how do I write out the petition on the paper? Just 3 times my name and the petition circling around it? or is there a different method for doing a job spell? As Mary noted, a Steady Work spell might be more suited to your purpose than a honey jar...unless your goal for the honey jar is to aid your networking and encourage friendliness and helpfulness toward you by those people you will be interacting with in the course of your job search--from the administrative assistants to the hiring managers to that friend-of-a-friend who knows about that open position that you are a perfect match for. For a very general form of such a petition, I would write a descriptive phrase encompassing all such persons ("All persons, known or unknown to me, who are able to assist me in obtaining gainful employment that is mutually beneficial to myself and my employer"...or somesuch), cross it with my name 3 times, and write my petition in an unbroken circle around it ("notice me help me hire me (etc.)"). Dress it with Steady Work oil or sachet, place a pinch of gravel root, deer's tongue, master of the woods, etc.in it, fold it up, and put it in the honey jar, tasting the honey as you do so. Today is day two and my candles melted significantly. Not sure why. I doubt I have 5 more days worth of candle left. Any suggestions on what to do? Oh it was the Steady Work kit and it was the blue candles. The white one is doing just fine. Wonder, does it mean anything or is it just hot? It could be just hot--candles need to be kept in a place where they are not going to melt of their own accord in order to get a good read on the spell. I would let the two burn out and then prepare two new blue ones to replace the ones that burned and to finish the spell. Im 23 and trying to open up doors to move out of moms house. So Im doing a honey jar spell to get this house i really want. before i call the landlord i want to do a honey jar spell on him with his name. what color candle should i burn for this and if i don't have the oil to dress it with..is it ok to use holy oil? what home product can use in place of it that can work just as much? also, can do this for this job i just applied for to sweeten the manager? its said a green candle is to get a job with a honey jar spell..can i use holy oil as well or what home based product? Um, not really sure what you mean by "home based" but for the house saint Joseph is often called upon to help with real estate problems and you can buy oil for him from LuckyMojo, you also might want some Road Opener, to well I'm sure you can figure that one out lol. For the boss, Steady Work is what you want to be using to get the job and then add Boss Fix once you have it. I got my triple strength job getting mojo yesterday and brought it to life today (super excited). I found a job listing that I am particularly interested in and applied today. I read in a thread how the triple strength can be very strong, I was wondering if it would be advisable to do work to supplement the mojo (as in I don't want to do "overload"). I was thinking of something gentle such as a honey jar and I was planning on praying to St. Joseph as well. Also I've been searching the forums for info on how to make a honey jar to get hired and I can't find it (I could have sworn I've seen it before?). If someone have any links that'd be so greatly appreciated. Look on the spell kits page. 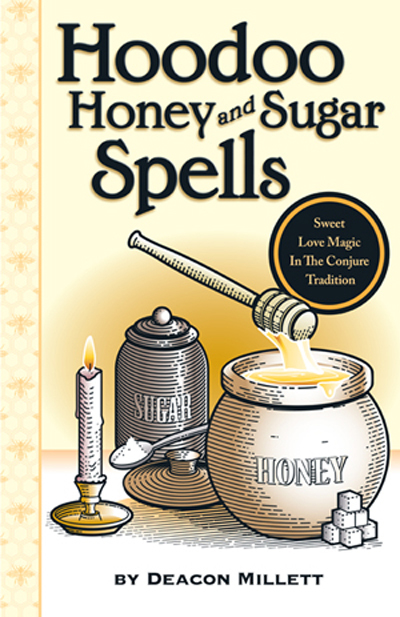 Honey jars are after the complete spell kits, and there is a honey jar for job-getting. thanks, but I wasnt going to buy a whole one kit. I already have LM oils, powders, herbs, so I thought it would be cheaper, quicker, and less wasteful to just buy a honey jar and use the LM supplies on it. for job getting sweet jar, i would put in master of the woods, gravel, all-spice, some magnetic sand, work steady powder or oil on the candle if you have it. Grains of paradise is another good herb to use as well. But if you do not have all or a few of these you can work some work steady powder or oil. In side the jar, you can take the description, company, and position of the job, and put your picture face to face inside the jar. I would burn a green, or yellow candle on the jar. Don't forget five-finger grass - helps get them to favor you! I have a question, I have an existing Steady Work Honey Jar, with two of my managers names in it. Our office structure has changed a bit, new manager, and all new co-workers. New Manager and all his people he's brought in, do not care for me, and are never satisfied with my work. Anyways, I ordered Boss Fix oil to mix with my Steady Work oil for my Steady Work honey jar candles. I plan on adding all management and the two problem co-workers to the honey jar. I forgot to order parchment paper, but can't I use brown paper bag for the new names??? I dont have a lot of money, but should I have ordered Boss Fix powder for my worksite??? I was thinking of adding Stop Gossip products too, but I can achieve that goal in my petition on my Steady Work honey jar, right? Re: Steady Work with Boss Fix Oil????? Yes, you can use brown paper bag for the new names. Yes, I would keep Boss Fix sachet powder for the work place. Stop Gossip is different spell from Steady Work or Boss Fix, can be blended with those two for use in the workplace. Different herbs are used to stop gossip than to keep a steady job or to fix a boss. with the Boss Fix oil added to the Steady Work candles, cant i petition them to only speak my name in praise, in addition to treating me well, etc? In other words, not to stop gossip but to encourage praise. Caligirl, yes, that is a good idea. Hello! I have a situation that I need some assistance with, and hopefully this is the right place to ask it. I recently applied for a job that, if I got it, would be one of my dreams come true. I filled out the [paper] application [they're still pretty low tech, as most places only accept online apps] and dusted the application, my resume, cover letter, and envelope with Steady Work sachet powder. I also anointed my hands with Steady Work oil as I worked on this. Then after I mailed it I posted a prayer request over at the Crystal Silence League [which has been so wonderful!]. 1] Should I include the postcard they sent me in the jar with my petition? My thinking is that since it's sort of a personal concern [ie, someone from human resources touched it and their handwriting is on it] it would be helpful. 2] Any suggestions for powders, herbs, other things that can also go in the jar? 3] Any suggestions on prayers, psalms, anything else I could do for success? 4] I'd also like to have LM light a candle for me on the MISC altar. What candle would be the best choice? I bought a pre-prepared "Steady Work" jar spell kit and it says the work can be "extended" by burning more yellow altar candles dressed with steady work oil on top of the honey jar. I also bought a "fixed" glass-encased "Steady Work" candle. I was wondering instead of burning more dressed yellow candles on top go the jar can I just set the glass-encased Steady work candle beside the jar and burn that and get the same effect? The technical term for what you are planning to do is to use the Steady Work glass-encased vigil candle as a "helper light" rather than burn it on the honey jar -- and, yes, this is traditional and it is considered effective. 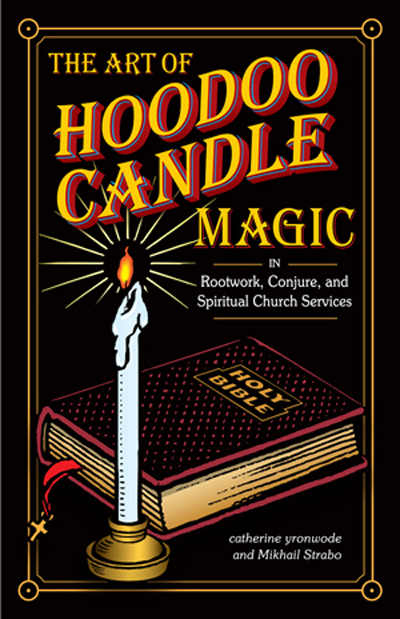 You can read more about helper lights and how they are used in my book "The Art of Hoodoo Candle Magic." Oh, man, I got a blow today. I've been putting much effort into a full time teaching search (I've been on the LMHRH Radio Hour a couple times to get help with it, among other things) and the school at which I've applied just informed me that my PT courses were cancelled, and I have EVEN LESS work next term. Man, what is happening?? This hurt, I'm scared, and it's a moment of looking at that Steady Work Honey Jar that has the names of two places that have pulled steady work away inside it wondering what's going on. I won't know the status of the FT search for months.. and really, this is a much more urgent matter. ...and I think it's time to feed the old Steady Work Honey Jar to the ants with a prayer, and make a fresh one with fresh goals. I have a good selection of herbs for work and money attraction I can put in it...heck, I'll even put a lodestone and pyrite in there if the professionals on this forum list recommend it... would anyone suggest that I also throw an uncrossing herb in there too? Advice on this would help, from any of you. I know worrying is not helpful to magical work. But I'm just in shock right now. My god, I'm so tired of all this struggling and the floor constantly being pulled out... if there's another working someone would recommend, I'd be super grateful. magicmurphy, I'm sorry to hear that you've hit a pretty big block. Honey jars don't go stale, but if you are doubting its effectiveness then it might be time to start over and make a fresh one. Thanks for your quick response, Miss Phoenix. I think that's what I'll do. I did put in a MISC Candle Service order to. I'll take all the help I can get. I wonder if anyone could tell me colour for the candle to burn on top the steady work honey jar? 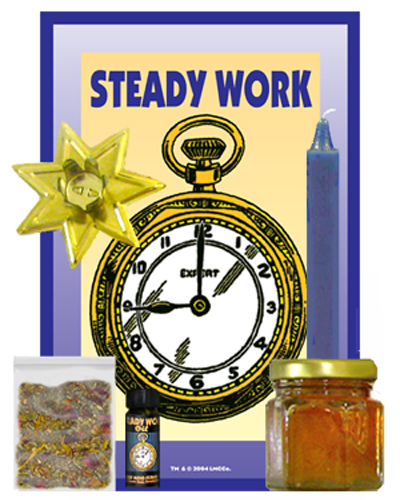 My steady work honey jar kit came with a yellow candle but the photo on the website catalogue show a blue candle for the steady work honey jar kit. The traditional colour is blue. Yellow is also used. The blue was taught by Papa Jim of Texas and can also be found in old accounts of the 1930s. The yellow was taught by Mikhail Strabo, among others. Some choose green, for money, also taught by Mikhail Strabo. So, I've just ordered a Steady Work Honey Jar. I'm planning on putting the name of the hiring manager of the firm I want to work for in it, in an effort to get them to hire me. Is this a valid use of the spell? Follow up: supposing I put the names of more than one person in there, if I have more than one job I'm applying for; will that work, or have an adverse effect? The key is to keep the work focused, Bill. I have found that placing several bosses in the same firm all together in one jar works well. I would not, however, put in the names of six hiring manager from different firms. In that kind of case, I would simply make the jar "for those in power to bring me success and steady work in the future." I strongly agree with Deacon Millet, keeping the work focused provides much better results than trying to paint the situation with broad strokes. Personally I'd put the names of prospective bosses in a general honey jar to keep them sweet and focus the steady work jar on the job with the highest likelihood of being hired. Divination could be used to determine which job has the best potential for hiring you . A related and updated question: Fellowships and TA positions for grad students. Are they jobs, in so much as a steady work honey jar with the name of the appropriate decision maker(s) can help you get them? I ask because obviously they do function as jobs for the purpose of income, work experience, etc., but Fellowships especially have a strong academic component and would that mean that another formula, like Crown of Success or King Solomon, might be better suited? If this were me, I would use the Crown of Success along with the steady work honey jar. These positions do function as jobs. To acquire thee positions, use those. While in the position, I'd go again with the Crown Of Success a long with the King Solomon. Good evening! Could I get assistance with wording a concise petition for a steady work jar. It is for a friend who is a car salesman! Thank you! What do you want him to have? Thank you Miss Aida!! What I wanted sounded so "wordy" in my head! I so appreciate this forum! I just purchased a steady work honey jar kit and I have a couple questions. 1.) I'm a school teacher so I have a few bosses but there's one dean in particular I don't think likes me. There's also an older teacher there who I'd like for her to mentor me. I'm not sure whose name to cross with mine, or how to word my petition. 2.) The blue candle broke. Can I just melt it back together or should o get another. I will answer each question after your question. OK? OKAY! 3.) Will it still be effective if I can only burn it at home and not in my classroom (safety hazard)- That's absolutely fine!! Thank you Miss Aida! Your answers were very helpful! One last question: the instructions say to light the candle every MWF. Is it okay to start on a Wednesday to follow the pattern? Can you Do a steady Job Ritual for someone else? My mom has just been laid off from her job of 20 years. However, she doesn't believe in Hoodoo, but I want to help. I have a steady job ritual, however alot of the details are very specific that the person has to do themselves. I wanted to know if it is possible to do this specific ritual FOR someone. If not, is there an alternative? You can most definitely perform the spell for her. Wherever it says: "You' or "Your name", etc. replace it with hers. Rootworkers do these spells all the time for clients. And they have pretty good results! What would I add to a honey jar for getting a specific job? I just got my steady work honey jar but I am needing some assistance. I am looking for an industry specific job, but not a company specific job. So i do not have a company name/bosses name/hiring officers name to use for this spell, only a job title. What would be the best way to use this spell kit in order to obtain a job and maintain steady work? If you do not have a specific company in mind as your employment goal, but a job title in a specific industry, then you can petition for "the right position for me as a (job title) in the (industry) field". If the job title refers to the hiring manager, then use that in place of a proper name for the person you wish to influence. Ok so situation is changed a little bit! I have applied for a specific job, with a company, and i do not have the full name of the hiring manager but I have their intials. What should I include on the petition to obtain this specific position? Do i burn 1 candle per day (monday, wednesday and friday)? If I am adding other herbs, do I fix the candle with them or add them into the honey? what would you suggest to chant or say? I have the job posting printed, should I do anything with that? What about my resume? Should I print that out and so anything? Anything else I should know is appreciated, I am hoping to start this today as the posting closes tomorrow, and i will know in 1 week if i am getting an interview. You can state your petition according to the job you want "(Position X) will be offered to me" or words to that effect. You can burn a candle as often as you wish. For additional herbs, you can either use them on your candle or add them to the jar. But why not spend enough time mapping out your spell so you can include everything from the start? You can put the job posting underneath the jar as you work it. Good luck! Go get that job! Hello about a year ago I purchased a steady work honey jar and was very pleased with the results. I have now switched jobs still medical administration and I was wondering if I can open the jar take out the petition and replace it with a new one for the job?